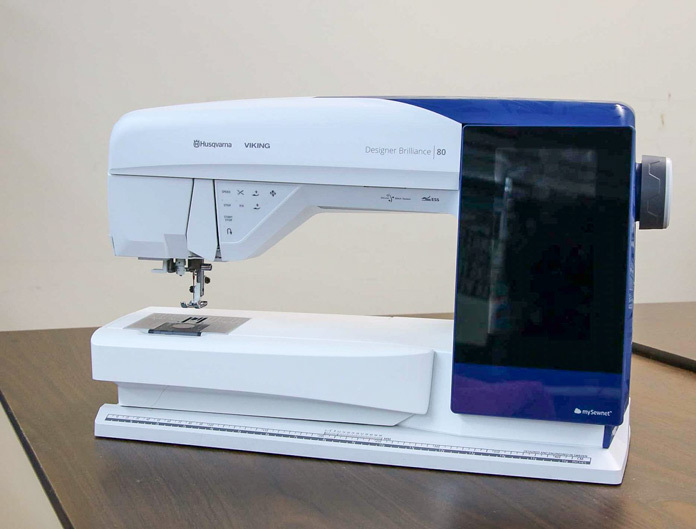 Home » Husqvarna Viking » Husqvarna Viking Designer Brilliance 80 » QuickDesign app + Designer Brilliance 80 sewing machine = WOW! Isn’t that Design Positioning on the HUSQVARNA VIKING Designer Brilliance 80 amazing?! I have another feature to show you today that will amaze you. I’ve seen it, I’ve played with it and I’m still amazed at how easy this is and what it creates. I know – you want to see, so let’s get started. The Designer Brilliance 80 comes loaded with over 565 embroidery designs. In addition, there are many, many designs that you can purchase from numerous designers. But what if you want to create your own? Well – there’s an app for that! Please be mindful of copyright when you work with the feature I’ll be showing you. 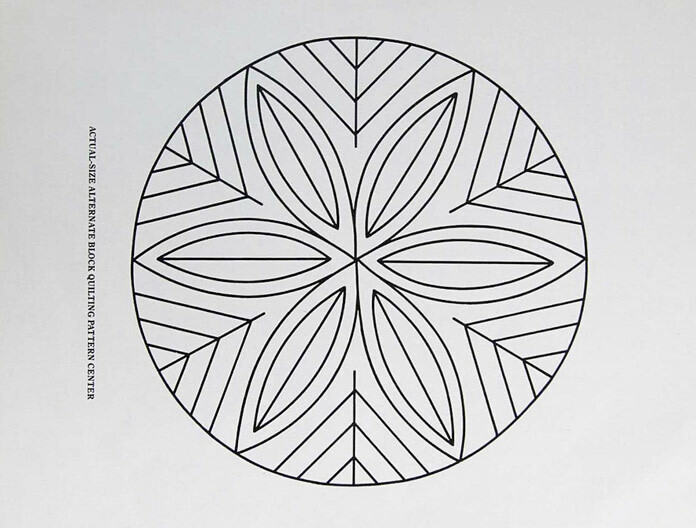 My image is a quilting design that I clipped from a quilting magazine years ago. So how did that same design get stitched out to look like this? That’s what today’s post is all about. I’ll show you how easy it is to take an image and translate the image into an embroidery design. HUSQVARNA VIKING has introduced three new apps that you can download for free from your app store – either Android or Apple. The one I’m playing with today is called QuickDesign. This is a free app. The technology is constantly being improved as is all technology these days. And I think we’re only limited by our imaginations as advancements are made. Of course, if we want a really powerful software for creating and modifying embroidery designs, one only has to look at Premiere +2 which is an amazing tool. To get started, I highly recommend you use line drawings or something with clearly defined lines. Yes – anyone can download this app. You don’t need a HUSQVARNA VIKING sewing machine to play with it. As I mentioned, it’s free. BUT – if you have a mySewnet account and you’re logged in when you take that picture, you can save that file to your mySewnet account. There are some basic edits within the app – stitch type and size on the app. In my example, I simply took the picture and saved it to mySewnet account. I didn’t edit, I simply chose the stitch type that looked the best and I believe I chose the largest size. 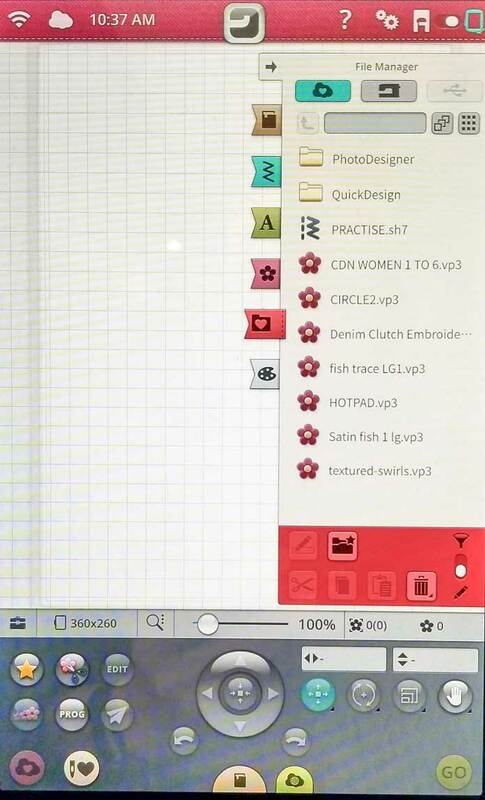 You can see that the file has been saved to mySewnet account and I’m getting a preview of the design. I chose a satin stitch as the stitch type – notice, I’m getting a preview of what the design will look like in my FREE app. But wait – there’s more! Haven’t you always wanted to say that? Well, in this case – there’s a LOT more because I know you’re all thinking – big deal. 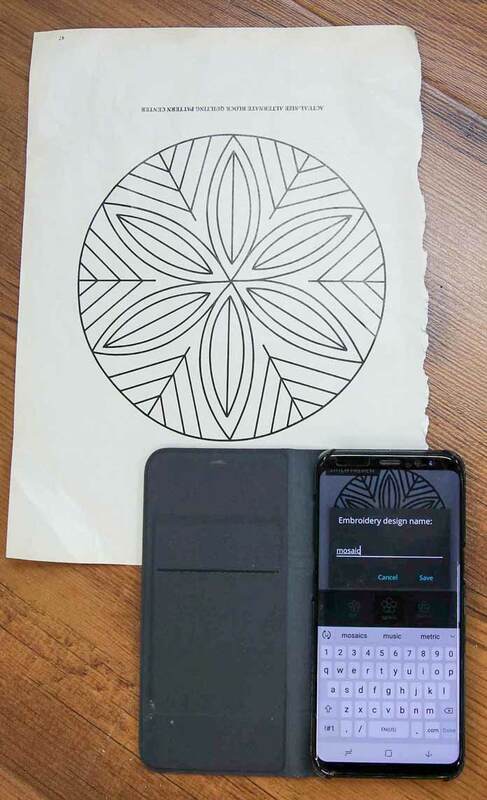 You took a picture of a design and it’s on your phone. Here’s the “there’s more!”. 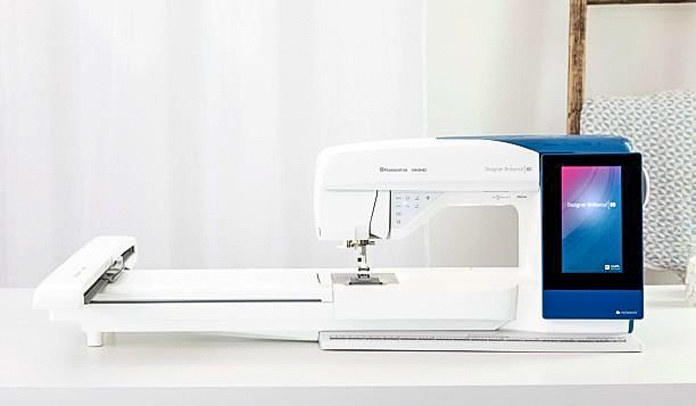 If you have a Wi-Fi enabled sewing machine like the HUSQVARNA VIKING Designer Brilliance 80, I can connect that machine to mySewnet account (which is a cloud-based software), then guess what happens? Yes – that saved file is sitting in the cloud and I’m able to access the cloud from the menu of the Designer Brilliance 80 and yes – I can open that file. NO USBs, no cords, it’s all in the cloud! Now isn’t that amazing!!!! But wait – there’s MORE. In the File Manager below you can see that the cloud is highlighted. The list of files in the cloud is shown. 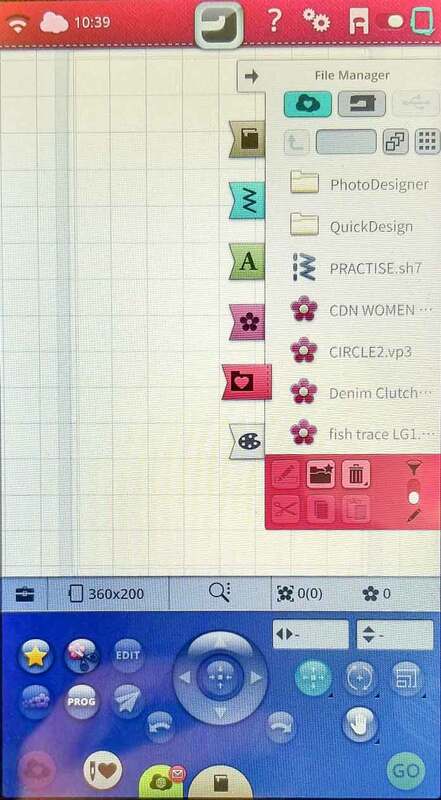 All files created in QuickDesign are saved to the QuickDesign folder. It took me a minute to figure that one out. I stared at the screen for a few minutes before the folder registered in my brain. I was looking for the file on its own. That’s pretty cool that the design file gets filed automatically into the appropriate folder. Once I realized where the file was saved, it was a simple matter of loading the file in the embroidery edit screen. 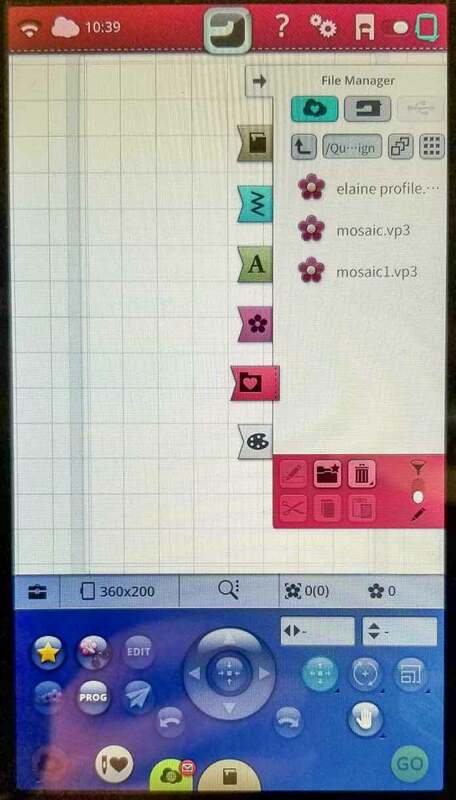 The File Manager system works the same as on your computer and I was able to load the file called mosaic1. Have a look at the extension of that file. Notice that it’s a .vp3 file. That’s a STITCHABLE file. Yes – that means that the free app took a picture of the line drawing. It converted the image into a digitized file based on my selections. A file was created that I uploaded to mySewnet account. All I need is a HUSQVARNA VIKING Wi-Fi enabled sewing machine, like the Designer Brilliance 80 and that file is ready to stitch! Doesn’t that blow you away? Here’s the design in the embroidery edit screen. 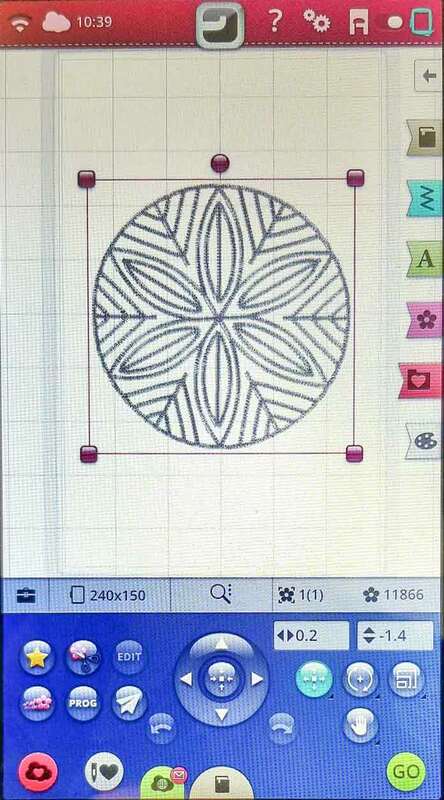 Now that the design file is loaded into the embroidery edit screen of the Designer Brilliance 80, I could do some more edits (resizing, adding letters, duplicating) if I chose and I could bring it into the Premier +2 Software for even further edits, but I’m happy with it the way it is. I hooped some fabric and chose a thread color and pressed START. All that’s left is to watch it stitch out. 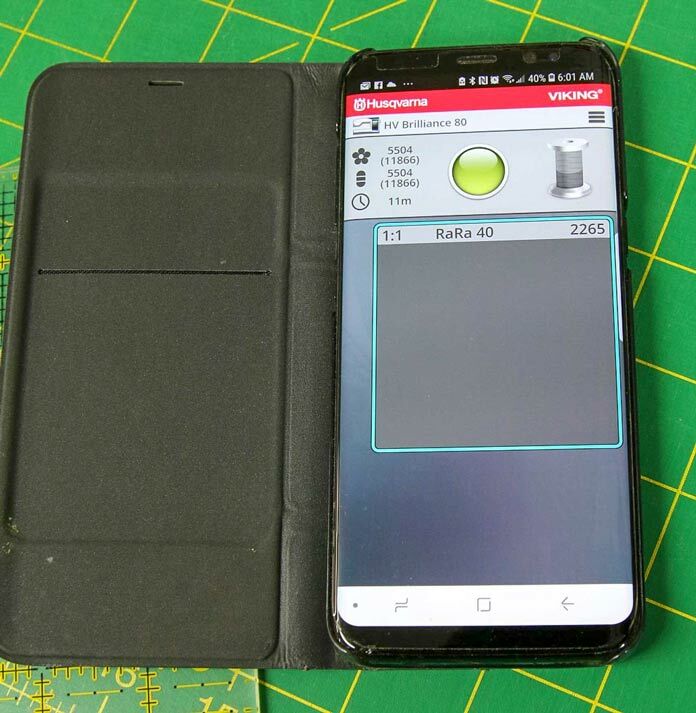 Another free app that you can download and use with Wifi enabled HUSQVARNA VIKING sewing machines is called mySewMonitor. 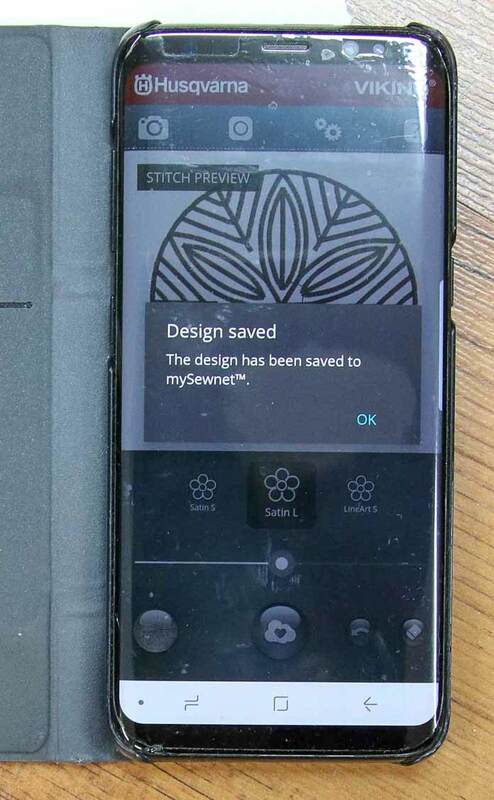 Again, using your mySewnet account, and making sure the sewing machine and your phone are both connected to the Wifi and connected to your mySewnet account, I’ll get status updates of the embroidery stitch out. I’ll get alerts if the bobbin needs to be changed, the thread color needs to be changed or the embroidery is done. I’ll also see the progress of the stitches as the embroidery progresses. This is huge especially if you’re like me and my studio is in the basement and I can’t always be there. What was neat is that I happened to have the HUSQVARNA VIKING Designer EPIC (which is also Wifi enabled) up and running at the same time as I uploaded that file to mySewnet. And sure enough – when I looked in the File Manager, the file was sitting in the Quick Design folder so technically, I could have stitched the design out on both machines and I didn’t have to share the design via USB or cables. It’s all in the mySewnet cloud. Here’s the final stitch out. This is absolutely incredible. 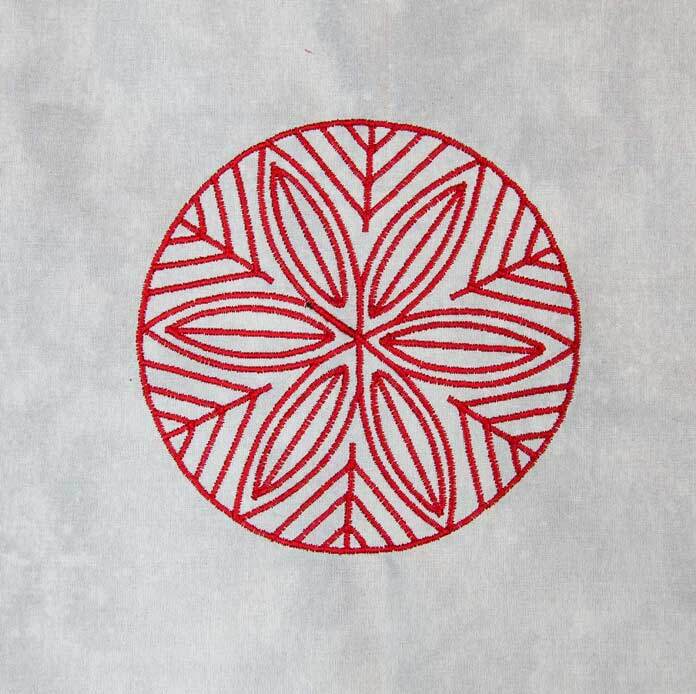 Look at the quality of the design and the quality of the satin stitch. It’s perfect. I’m so impressed by this technology and I know that it will only get better. There’s so much that you can do with this app – this is just the tip of the iceberg. I want to explore the other stitch types and sizes and bringing it into the stitch edit screen or even the software and make even more sophisticated designs. Think about taking pictures of photographs with clean lines and see what can be done with that. The possibilities are endless. As I said, I’m only limited by my imagination and by time! I think I’m going to have to get that HUSQVARNA VIKING Designer Brilliance 80 working 24/7 in order to get all my ideas stitched out. Be sure to come back tomorrow as I wrap up the week with a couple of other things that I’ve accomplished using this fabulous sewing and embroidery machine. Wow. this is wonderful! I don’t have an embroidery machine but I have always wondered how they worl!